In kindergarten, we finished up our plant unit this past week. Have you ever heard of the book, A Plant Called Spot, by Nancy J. Peteraf. I can't get over how cute it is. The children and I thoroughly enjoyed the story and the adorable illustrations. After I read the book, we talked about our favorite part. I model wrote my favorite part and then the children did the same. My favorite part in the book was when Teddy treated the plant nice. We also wrote some facts about plants. Click on the picture above to download the plant fact sheet I used. 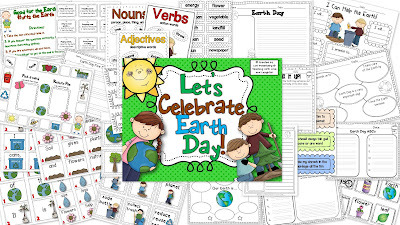 If you are not done planning your Earth Day activities, please check out my Earth Day Unit by clicking on the picture below. I am excited to get started using the activities next week. Have a great weekend! Looks like a good book! Love the writing! I highly recommend this book. It's so cute and there's a great lesson to be learned. Thanks for commenting! Love the plant freebie! Thank you!! Thanks, Jen! The children really enjoyed the book, therefore, they were very excited to write about it. Lori, Is this free download still available? I wanted to share a link to your blog post with my readers. Thanks! I just updated the link! Thanks for sharing!